Worthy Of A Bigger Audience. Worthy Of A Bigger Audience is a blog featuring musicians, TV shows, movies, books, games, apps, graphic novels, travel destinations and in fact anything at all which is worthy of a bigger audience. That doesn’t mean that when it comes to music, for example, that only unknown and undiscovered artists will be featured on the blog. Some of the reviews will be of reasonably well known talented artists who have already achieved a fairly large amount of commercial success and critical acclaim. It’s just that in the opinion of this blog, the level of their success should be even higher. 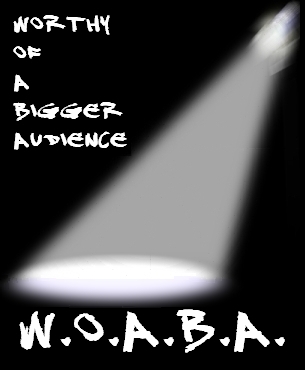 So that’s the criteria which will be used to decide who and what exactly gets featured on Worthy Of A Bigger Audience (known as Woaba Blog for short). Woaba Blog won’t only be covering unknown musicians, movies, books, etc. It’ll feature anything which is worthy of a bigger audience. Just like the title says. Obviously at the moment this is only a small blog with just a few reviews featured so far, and not a top TV show with a viewing audience of millions or a high circulation newspaper, so any publicity that Woaba Blog creates will be minimal at best. But I’m a firm believer in the butterfly effect so even a small difference is better than no difference at all. Would you be interested in featuring Little Brother Eli?